When I was younger, I have identified five qualities I’m looking from a guy for me to like him. One, he should be smart. I really admire those guys who excel academically. For me,that means he really values education more than anything else. Two, he should know how to play guitar and can also sing a tune so that he’ll be able to serenade me and maybe write a song for me. Four, he must be athletic or at least know how to play basketball. Lastly, he must love reading like I do. Yeah, I know you’re thinking that explains why I’m still single even at this age. Anyway, that was before and I’m not going to say more about my kind of guy. 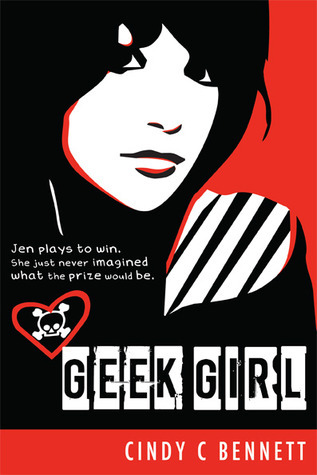 I was just reminded of this thought because of this book and I’m thinking, maybe my type was actually a geek. Moving on to my review, the plot may not be extraordinary and unique but somehow, I find it new and fresh. Maybe because it’s the first book I’ve read with this kind of plot. I also love the characters, Jen and Trevor, for they are both strong and the story was well-developed that I became so engrossed and finished it overnight. What really makes me love this book was the way the author revealed piece by piece the reason behind Jen’s character and how she was able to deal with her issues. Friend, i know someone who plays guitar, played soccer instead of basketball, you would be the judge if he is smart and he reads too, bob ong’s. Haha! perhaps you already know who he is.